O.K., I'm way too white and Mormon to say that. I've had a lot of new people stop by and say hello recently, and I just wanted to take a minute to say hi back. And to say thank you for dropping in--all of you. I'm still a little stunned when I look at my stats and see that more than just my friends and family are reading my self absorbed drivel. A lot more. Enough that it makes me a little dizzy if I think about it. If I wasn't perpetually broke I'd offer a fabulous giveaway, but I am, so hopefully my heartfelt appreciation is enough. And Gay Chad loves you, too. hahaha, a Peep show! I love the Peep pasties. 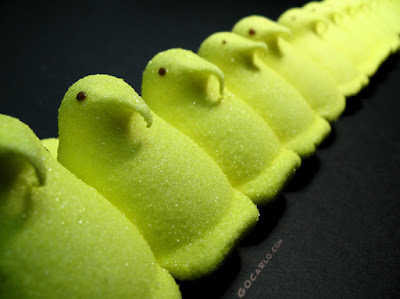 I hate Peeps, but man, they are the cutest junk food ever. "Peep Show" -I love it. And I have to agree with April. Disgusting to eat, but so so cute. Like babies! Yes, I know. There's something wrong with me. The only way I like them is toasted over an open flame, so the insides are gooey and the outside forms a hard caramelly shell. Where do you find these things? The Peep Show kills me. OMG, so glad I came back. "Like babies." I'm still laughing. Go Brandi, Go Brandi! In contrast I have GAINED 8 pounds while I have been here so you have ALMOST motivated me to get off my duff and start working out. Almost. Loved the Peep show!! Just today someone gave me a Chocolate mousse Peep to try. I have never been a fan and was sure that I would hate it but it was actually quite yummy. I can only imagine how good it would be toasted. As a Co-Founder Fugly (I'm a little Uglier than Chrysta), you can totally make it in. And I don't need no stinkin' giveway -- I'm just happy to be a peeps. Keep it up. You are doing a great job!